About 75 miles east of Winnipeg the Whiteshell Forest Reserve intrudes upon the first prairie steppe. Here the plains, which sweep eastward for a thousand miles from the foothills of the Rockies, yield their fertile acres before the mid-continental barrier of the Pre-Cambrian Shield. The vast patchwork quilt of grain stubble and pasture, gradually merges into a hinterland of rocks, rivers, lakes and forests. The Whiteshell is pitted with large outcrops of base rock, some many acres in area. These were moulded thousands of years ago by the giant maws of glaciers. The underlying rock subject to terrific pressure was gouged and hacked, rasped and planed, and some large segments recumbent beneath the ice-cap, were rendered smooth and flat. Other formations, more obdurate, resisted marginal pressures and thrust their jagged shoulders above the glacial bed and preserved their fantastic shapes. Mosaic designs to be seen at the Nutimik site. On the smooth rock shelves of the Whiteshell there are strange figures made of boulders. They are found usually on high plateaus, or on the crest of precipitous portages. Mystery surrounds these figures. No one knows who built them, or how they were used. Some guesses have been made. Some opinions have been expressed, but no appraisal has satisfied all authorities. Such opinions as have been voiced fall far short of unanimity. This unhappy void probably springs from the fact that no archaeologist or anthropologist has ever made a definitive study of these stones, which are commonly referred to as boulder mosaics. Some of the stones that form the mosaics weigh several hundred pounds. These may rest upon the very places where they were cast by the receding ice shield. Smaller stones have been placed in line with larger ones, and some surround large central boulders to form a variety of patterns. The designs include, squares and triangles, circles and spoked wheels. Some outline the figures of men, turtles and fish, others form snakes and birds. Most of the rocks are heavily encrusted with moss and lichens. Some are completely covered, and only after painstaking search may they be distinguished from the underlying terrain. Some of the largest mosaics are snakes. Their long sinuous coils stretch for 300 feet or more across the base rock. The head is usually a large, flat rock, triangular in shape. Stones of diminishing size taper off toward the tail. The figures of fish and men are sometimes as long as 90 feet, and frequently as broad as 20 feet at the widest point. Each turtle covers an area about eight times the size of a common school desk. Some designs of birds are as large as a standard basketball floor. 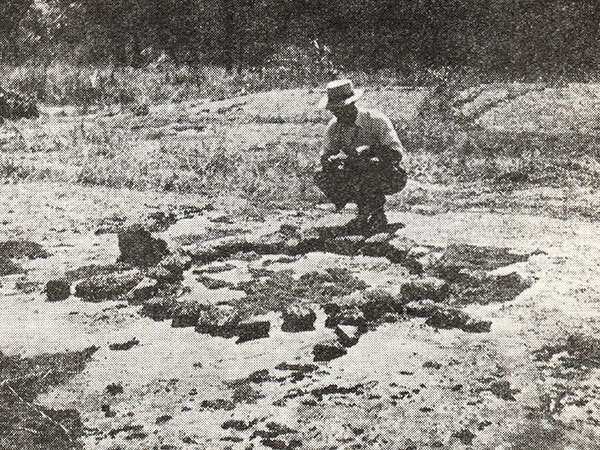 One series of mosaics, situated on a large plateau, forty feet above the surrounding muskeg, contains nothing but geometric designs. There are triangles enclosed in circles and small circles within larger ones. There are squares and rectangles and some parallelograms. 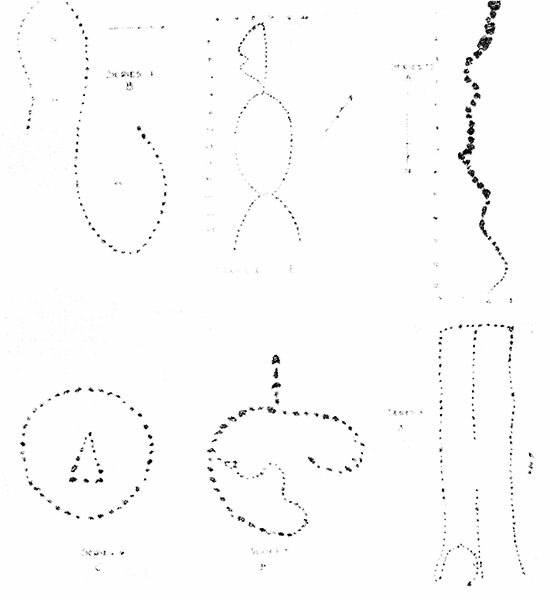 Some of these are linked by long chains of smaller stones whose convex loops always incline to the perimeter. A view of the mosaics, Lake Nutimik Site. These particular mosaics were spotted by a keen-eyed forester on aerial patrol a few years ago. They are inaccessible from the ground. Thus it may be assumed that they retain their original conformation. Only severe storms or foraging game may have shifted them. Some mosaics near to main roads have been disturbed by vandals, or by curious people who knew not what they were. Others have been upturned and pushed out of place by bush workers employed in cutting lumber roads to pulpwood stands. But deep in the forests there are mosaics that have remained undisturbed. They are known only to a few foresters, trappers and government officials. These designs have been copied and have been used to reconstruct the mosaics at Nutimik Lake, which were opened for public inspection for the first time last summer. The reconstruction involved the making of accurate grid tracings, incorporating the exact position of each rock. 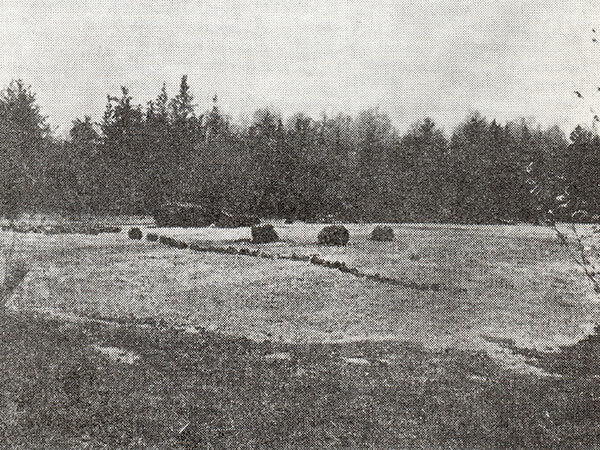 When this was completed the stones at the Nutimik site were replaced in their original positions. An additional aid to reconstruction was found in the light patches which marked the original location of the stones, as contrasted with the dark surface weathering on the surrounding base rock. The earliest known reference to the mosaics goes back less than 200 years to the journal of Sir Alexander Mackenzie. The year is 1793. He is on his way down the Winnipeg River, which today flanks the northern limits of the Whiteshell Forest Reserve. At a portage on the Winnipeg River, Sir Alexander makes a stop at a place called Lac du Bonnet. He commits the following observation to his journal: "This portage is near half a league in length, and derives its name from the custom the Indians have of crowning stones, laid in a circle on the highest rock of the portage, with wreaths of herbage and branches." What tribe of Indians built the mosaics? Some authorities suggest that they are the work of the Ojibwa nation. They base their assumption on the fact that the turtle and the snake both played important parts in the ritual of that tribe. Many of the principal mosaics in the Whiteshell are outlines of these figures. The insistence by some authorities that the mosaics are the work of the Ojibwa presupposes that they were built sometime within the last 250 years. But other observers suggest that the mosaics have been in place for 1,000 to 2,000 years. One archaeologist, basing his estimate on the premise that the ice age was as recent as 10,000 years ago, suggests that the mosaics were built as much as 7,000 years ago. He reports that the glacial polish may still be seen under the boulders, and that the surrounding granite has been eroded away as much as three-quarters of an inch in some places. Such are the varying speculations surrounding the Whiteshell Mosaics. The closest evidence the writer has been able to assemble stems from the mouth of a very old Saulteaux Indian of the Hollow Water Band on the east shore of Lake Winnipeg. He was reputed to be over 100 years old, and admitted through an interpreter that he could remember 95 years ago, "but I don't think I can remember 100 years ago." He said that the location of the mosaics was known to all the old people, but that no ordinary member of the band would dare go near them. If he did, it was said, he would not live long afterwards. The mosaics, he continued, were used exclusively by the Medicine Men (The Grand Medicine Society of the Ojibwa). The Medicine Men of all degrees and their apprentices, from all the bands went to the place once a year and "made medicine." They got medicine out of the stones. After the ceremonies at the Mosaics the Medicine Men returned to their bands and held the Medicine Dance in which all members of the band participated. This statement may satisfy the query "who used them and for what purpose? But it is a relatively recent account (1952) and at the most would embrace a period of not more than 250 years, and a lineal descent of not more than eight generations in the Hollow Water Band. It does not tell us when the mosaics were originally built, or who were the first builders. Boulder mosaic of a turtle, Lake Nutimik site. At the entrance to the mosaics at the Nutimik Lake site, the Manitoba Historic Sites Advisory Board has erected two markers. One marker contains wording which followed closely the account of old Joe Black of the Hollow Water Saulteaux Band, whose narrative is recounted above. The other marker seeks to capture the spirit of the participants in the mosaic ceremonies. It bears the words: "You are about to enter a ceremonial ground of the Ojibwa (Saulteaux) Indians. Here the Medicine Men performed their rituals according to their ancient custom. This area was a rendezvous where they sought the aid of forces greater than themselves. Enter it then and remember that you walk upon ground venerated by our native people." Perhaps it is best to leave the unsolved mystery of the Whiteshell Mosaics on such a note as this.